A truly fast prime offering a portrait-length perspective, this black 50mm f/1.2 Lens from Rokinon is designed for Micro Four Thirds mirrorless cameras where it provides a 100mm equivalent focal length. The combination of the long perspective and bright f/1.2 maximum aperture enables extensive control over focus placement, which is further complemented by the manual focus design and rounded nine-blade diaphragm for a smooth bokeh quality. The lens construction incorporates a pair of aspherical elements to minimize chromatic aberrations and distortions for a cleaner, sharper image quality void of color fringing. An Ultra Multi-Coating has also been applied to boost contrast by suppressing lens flare and ghosting. This 50mm f/1.2 lens is designed for Micro Four Thirds mirrorless cameras and provides a 100mm equivalent focal length. Bright, fast f/1.2 maximum aperture benefits working in difficult lighting conditions and also avails extensive control over shallow depth of field. Two aspherical elements help to control chromatic and comatic aberrations in order to achieve greater sharpness and clarity. 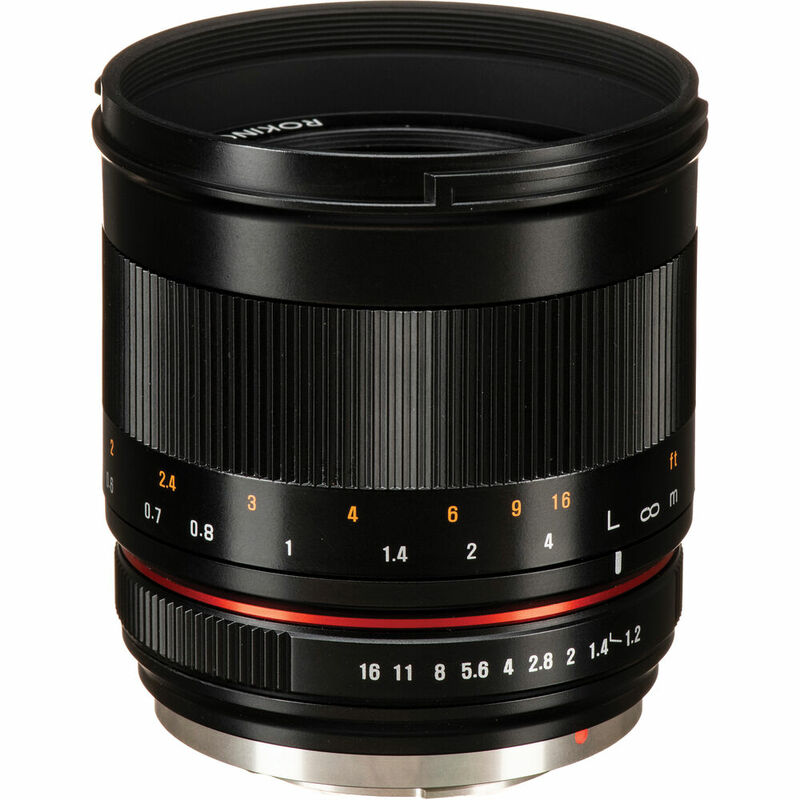 50mm f/1.2 Lens for Micro Four Thirds (Black) is rated 3.5 out of 5 by 4. Rated 4 out of 5 by Buck from Loving It! i bought the 12mm Samyang and love it, now this 50mm Rokinon, I'm loving it too. They are made by the same company. Incredible lenses! The images look like those made with far more expensive glass. I was originally worried about going back to manual focus, but I'm actually enjoying it, and for many shots it's an advantage. I love having a real focus ring and aperture ring on a lens again. I have old, and very experienced eyes. The only thing I'm really missing so far is the metadata, that's why I gave it four stars. Rated 5 out of 5 by Taylor from Wonderful build and optics, but not a small lens I am pretty shocked at how fantastic this lens is optically. It is amazingly sharp edge to edge right at f1.2 and really doesn't need to be stopped down. The Bokeh quality it top notch and the colors and contrast are great. Mechanical operation is solid and smooth and the build is very good. The only drawback for this lens is that for micro 4/3, it is fairly big and heavy. But, that can also be said of the closest AF lens alternative, the Panasonic Leica 42.5mm f1.2. You probably know this is Manual only lens. So if you aren't comfortable with that, this is not for you. With many of the newer cameras, focus peaking and center magnification make it easier, but it's still not as nice as a quick AF button (or face detect AF since this is most likely a portrait lens). TL;DR - If you are OK with a manual only lens, this definitely holds its own against the super expensive Leica 42.5mm F1.2 and the best AF lenses in the system. It's simply superb. Rated 3 out of 5 by Scott from Workable for family portraits on a budget Wide open, it's not especially sharp compared to e.g. the Olympus 45 1.8.? But that is often a tradeoff with large-aperture lenses, and some don't mind a bit of softness in a portrait lens.? If f/1.2 on a budget is important, you can handle or learn manual focusing, and you aren't making large prints, it might be perfect.? I've grown to like it, but I wish I'd bought it on sale. Note:? If Sigma releases an autofocus 50 1.4 with sharpness and price comparable to their 30 1.4, this lens would lose most of its appeal. Rated 2 out of 5 by Phil from Not acceptable for my purposes Based on the previous reviews, I was hoping for a fairly sharp lens. But after some thorough testing, I am quite disappointed. On my micro 4/3 Panasonic GX85, the sharpness of this lens is fine at the center of an image, but falls off to an unacceptably soft blurry look at the edges. And, focusing this lens is very fiddly. Even with a good zoom on the camera back display, establishing max sharpness takes a very delicate touch. I bought this fast lens for shooting large flat paintings in controlled lighting settings. When I capture a 4 ft wide painting at f 5.6 (about 12 ft from the target) the image became unusably soft at the edges. Sharpness improved at f 11. I sent the lens and some of my test images back to Rokinon to see if they agreed that it was defective. They said it was within spec, and not defective. That's disappointing, and this lens is going back to B&H. I just bought a 50mm f/1.2 MFT Rokinon lens for my GH4 camera, but when attached a message''lens not found''shows up, what's going on? Since this lens does not have electronic contacts it in, you would need to set your GH4 to Shoot without lens , which is found in the shooting menu of the camera and will enable you to use the lens. What is the T stop of the lens at f1.2? This is not a Cine Lens. The aperture is calculated in f/stops not T stops. The transmission would not have been measured at each aperture. Are these lens compatible with Olympus OMD EM10 camera? Are the grooves deep enough for a follow focus to be used without any additional parts? There are many different types of follow focus systems. Some use a gear you attach to the lens and others use pressure. The lens has not been tested by most follow focus manufactures but it should work with most systems. Is this lense compatible with my GH4 camera? This lens will be compatible with the GH4. Is the lens hood removable? Answered by: KENNETH D S.